I talked To Mr. Candace Ware. He have HORSE CARRIAGE now. I asked him about how a horse survives In the unnatural areas of New York City, where the ground is cement and the air is full of pollution, and what a horse will go through when they're older. Please Click on the "How You Can Help"Tab NOW! Every year, the list of accidents ↑↑involving horse-drawn carriages grows, and horses continue to endure pain and suffering because of this outdated practice. These gentle animals suffer from respiratory ailments because they breathe in exhaust fumes, and they develop debilitating leg problems from walking on hard surfaces. Horses have even dropped dead from heatstroke after working in scorching summer heat and humidity.The only way to end this cruelty is to ban it permanently and give these horses the freedom that they deserve. the horses. And that strain is not restricted to the streets. a paddock for turnout, the ability to graze or the freedom to roll and run. period," the mayor said two days before taking office. who profit from it keep trying. 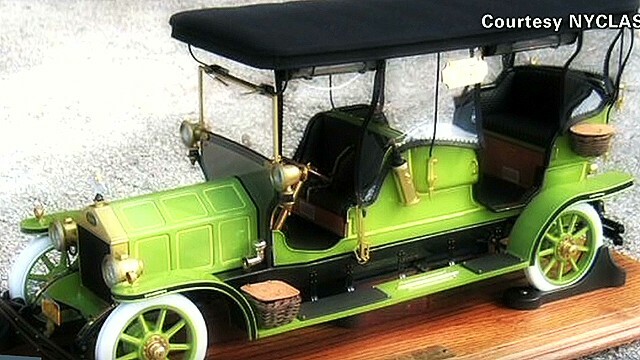 A carriage driver and industry spokesperson recently told CNN that only "two different sides"
horses and give their first impression based on something they read on the Internet." That statement indicates a deliberate ignorance that serves neither the horses nor the truth. well as horse-driven, the paramount question is "What's in the best interest of the horses?" "radical animal rights extremists" to protect industry? Are the concerns about lost jobs legitimate? Absolutely. and paper-thin arguments to sway this debate is irresponsible. Carriage horses have ample "vacation time." This may come as news to some, but horses don't understand the idea of workplace benefits. your job, you can quit. The presence of police horses means the use of carriage horses is appropriate. officers and ticket scalpers are both humans -- but their roles could not be more different. attend a two-day course and have a valid driver's license. Horses share our environment: If it's good enough for us, it's good enough for them. and traffic behind. Horses don't have that luxury. crowds. Sound like any city you know? The number of carriage horse violations and accidents is insignificant. cruelty for working a horse that was visibly injured. Incidents such as these shouldn't be tolerated, especially when the practice is so unnecessary. And New York City still needs carriage horses like it still needs subway tokens. If the practice ends, the horses will be destroyed or abandoned. get involved to help find and facilitate humane options for any horse in need of placement. whom they share the city. New York itself into a more civilized future that should be welcomed, not feared. Editor's note: Stephen Malone has been a horse-drawn carriage operator for 26 years. "Eloise at the Plaza," "Eloise at Christmastime"
My father stumbled upon the horse and carriages on Central Park South and hit the jackpot. 1967 and I intend on keeping it that way for years to come. provide a special moment for all my regular customers. and bred, for centuries, to pull loads. On average, my horses work alternate days, so they generally work three to four days a week. accident nor have any of my horses been seriously injured. and before returning. Our industry wants transparency when it comes to our horse care. that of a contented horse." horses are treated or meet with the men and women who work with them. the practice in New York could set a precedent that would put hundreds of people out of work. I will fight the ban. to get up close and pet a beautiful horse in an urban environment. The horse is the star. That special experience can't be replaced with an electric car. 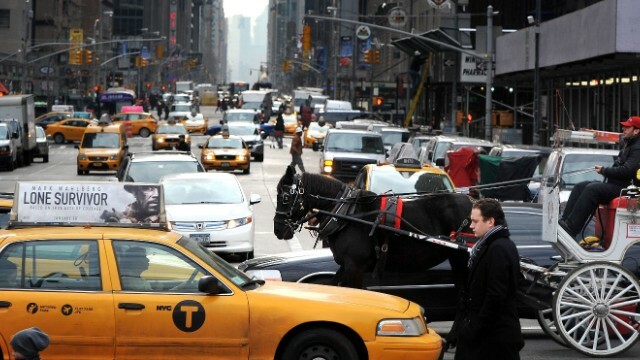 A horse pulls a carriage between cars and cabs along 59th Street in January. days in the summer are off-limits for the horses because of high temperatures and unsafe conditions. garage and storage unit properties throughout New York and New Jersey.Feldman brushed off questionsabout Nislick and NYCLASS. “Steve has been an animal rights philanthropist for a very long time…If he wanted to buy the land the stables are on, he would just buy the stables.” Several attempts by msnbc to reach de Blasio’s office for comment were unsuccessful. Both the ASPCA and NYCLASS say homes have been found for each of the horses if the proposal does succeed, but the drivers who own their horses may have to give them up. ⇒THE CARRIAGE HORSE BAN AND THE GREAT BETRAYAL-WHAT IS WRONG WITH THE MEDIA? ◆ Carriage Driver Is Charged With Animal Cruelty. ★See why the carriage horse industry has no place on the streets of New York. SUFFERING. THE CITY IS NO PLACE FOR A HORSE TO CALL HOME. ★Save The Carriage Horses In New York City! ★end to Horse-Drawn Carriages in New York!